CASTIEL TAKES ON HIS NEW ROLE AS GOD --- Castiel (Misha Collins) doesn't kill Sam (Jared Padalecki), Dean (Jensen Ackles) and Bobby (Jim Beaver) but warns them not to interfere in his business. Assuming his new role as God, Castiel sets out to right some of the wrongs in the world. Dean decides they should bind Death (guest star Julian Richings) and order him to stop Castiel, but the former angel is one step ahead of them, leaving Dean to face a very angry Death. Meanwhile, Sam struggles to deal with the broken wall in his head. Phil Sgriccia directed the episode written by Sera Gamble (#701). Ja, hat mich auch gewundert. Deswegen hab ich es erst nicht posten wollen. Bestimmt ein Flashback-Szene-Vorbereitung, als er Sam aus der Hölle geholt hatte? Was lässt dich das glauben...? Denke auch so wie Ratta! well... i don't like this god blah, blah story at all -.-. 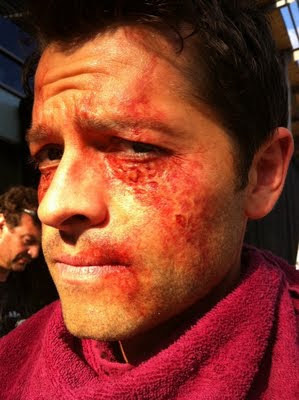 i want old cas back BUT i have to admit, misha as god looks interesting so yeah..we will see. i just HOPE they won't go too far with that god story. This is just "another" version of Supernatural's Gods. Or Cas Version per se. We'll see how this is playing out at all.